After so long in gestation, the 2008 election season has actually kind of snuck up on me. And what with the App store being released, I thought there would be a ton of politically-orientated apps out there. Incredibly, there are virtually none, and certainly none this cool. You can track polls, electoral vote estimates and so on based on live data, and organize it by state, candidate, percentage and all that. 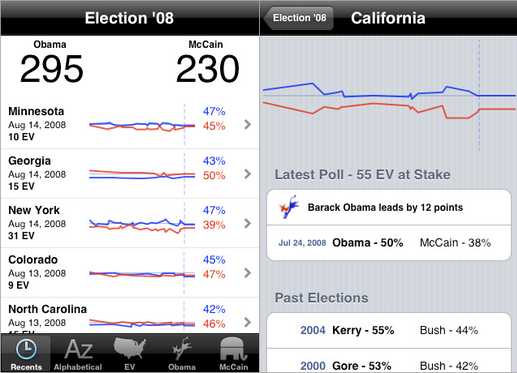 It even has historical data built-in so you can look at trends. Best of all, it’s nonpartisan. Whether you’re an Obamanaut or McCainicon, the data is presented to your liking and without comment (Independents are out of luck, as usual). The link is here and unfortunately it does cost money: you’ll soon be 99 cents closer to the poorhouse.